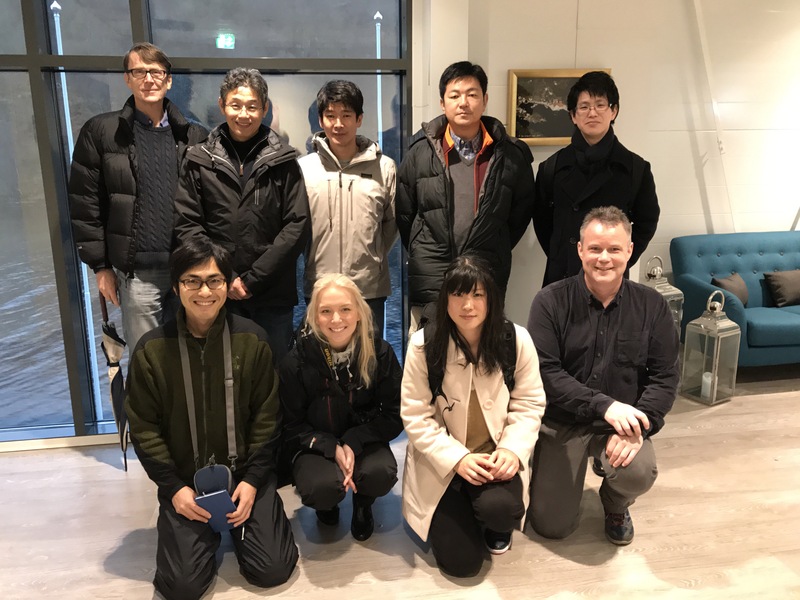 Japanese and Norwegian researchers and students were welcomed at Lerøy Seafood’s smolt facility in Bjørsvik. Photo: Lerøy Seafood. For Norway to be the best at closed-containment aquaculture systems (CCS) for salmon, we need knowledge from the best of the best. Norway’s researchers are now working with leading Japanese and North American researchers. Research on salmon’s needs is the key to creating sustainable production in CCS. This can reduce problems with sea lice and escape. In CtrlAQUA, a centre for research-based innovation, 21 research and industry partners are working to make closed systems off-the-shelf products by 2023. Some of the partners are now engaged in long-term development projects with leading research and development institutions in Japan, the USA, and Canada. One student from Bergen has been on a research exchange in Japan, researchers from Uni Research and the University of Bergen have visited Japan and Canada to undertake collaborative research on production challenges, and a Japanese researcher has been in Bergen to collect samples as part of ongoing CtrlAQUA projects. The next activity is a summer school for Norwegian, Japanese, and North American students at the University of Bergen. “The course is a fantastic opportunity for tomorrow’s aquaculture candidates to learn from the best in fish physiology,” says Professor Ivar Rønnestad, the project manager for the collaboration at the University of Bergen. The CtrlAQUA partners have achieved this collaboration with the help of seed money from the Research Council of Norway’s Aquaculture Programme and the Norwegian Centre for International Cooperation in Education (SIU). “It is absolutely crucial that we have such international development projects, and very positive that Norway and the Research Council initiates them. We get truly good collaboration when we share a period of time with other researchers across countries. In CtrlAQUA, we have already had concrete results from collaboration on fish physiology from these exchange projects,” says Bendik Fyhn Terjesen. He is the leader of the CtrlAQUA centre and a researcher at Nofima in Sunndalsøra. The exchange projects in which the CtrlAQUA partners are participating are called ExcelAQUA and NorAQUA. These projects aim for research institutions to establish long-term and institutional cooperation. Japanese and North American researchers are leaders in the field and can contribute to the sustainable growth of Norwegian aquaculture. Ingrid Gamlem, a master’s student in aquaculture biology at the University of Bergen, has spent a month at the University of Hokkaido to analyse samples. Gamlem’s master’s thesis is an important contribution for evaluating and documenting how Lerøy Seafood’s CCS facility PreLine is adapted to salmon’s growth and welfare. Japanese researchers and students have also visited Bergen, where they have retrieved samples from ongoing CtrlAQUA projects. The samples were transported back to Japan for further analysis. “Something that makes it interesting for them to collaborate with Norwegian researchers is that we are good at implementing specialists’ competencies in the industry. We have a strong tradition that the industry uses new knowledge and uses it actively to improve the salmon production potential. In Japan and Canada, farming has become more central, and they are interested in learning from how we work. In this way, CtrlAQUA could be an ambassador to connect the research and development needs of the Norwegian companies in Canada to the research community there,” says Nilsen. The NCE Seafood Innovation Cluster in Bergen is also involved in connecting the industry’s needs with research groups’ activities. In this way, the specialist communities from Japan and Canada can get first-hand insight into how Norwegian fish farming companies work. ExcelAQUA is a 3-year project financed by International Partnerships for Excellent Education and Research, INTPART, a collaborative programme between the Research Council of Norway and the Norwegian Centre for International Cooperation in Education. NorAQUA is a 4-year project directed by the partnership programme for North America, financed by the Norwegian Centre for International Cooperation in Education (SIU). Norwegian Partner Institutions: University of Bergen, Uni Research, Nofima, NCE Seafood Innovation Cluster Bergen, Industrilaboratoriet, Marine Harvest, and Grieg Seafood. International Partner Institutions: University of British Columbia, US Geological Survey, Hokkaido University, Nagoya University, National Research Institute of Aquaculture, St. Marianna University, The University of Tokyo, and Miyagi University of Education. Written by Reidun Lilleholt Kraugerud, Nofima.